Please contact us if you are interested in becoming a distributor. GraniteWMS (www.granitewms.com) is the flagship product of Cradle Technology Services, an end-to-end Warehouse Management Solution provider. 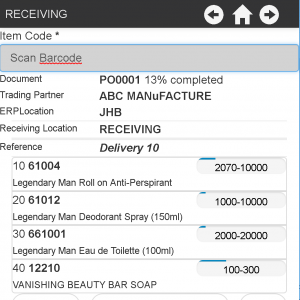 GraniteWMS fills a requirement for a simple barcode-based warehouse management system. It integrates easily into various ERP and accounting solutions. It EXPANDS & EXPOSES your warehouse operations & processes, while keeping the ERP inventory accurate. The Granite system is developed by a team that specialises in barcode systems. It has scanning processes at its core, ensuring that each user interaction is simple, efficient and embraces scanning before typing. GraniteWMS embraces best practices but more importantly, keeps everything simple. Restricting complexity has the amazing effect of reducing implementation time and effort –reducing your project cost. corporate distribution centres and huge warehouses. However, the wealth of functionality in these systems goes to waste as few companies are sophisticated enough to utilize it. Our reasoning – why pay for what you will never need. GraniteWMS is sized to meet most standard warehouse requirements. It does not suffer from functional bloat. business rules on your operators and we certainly do not want to reduce your ability to deliver goods rapidly and effectively from your warehouse. Our product is a lean, barcodedriven WMS that can be implemented rapidly and does not cost more than a standard delivery vehicle. Once implemented, GraniteWMS reduces time spent on basic Warehouse operations. Importantly, accuracy is achieved through immediate, live validation. Granite ensures that your Stock is well managed, saving money & time. Accuracy in picking reduces credit notes and ensures happy customers. Properly implemented processes combined with labelling, scanning and process visibility via live, online transactions ensure visibility.